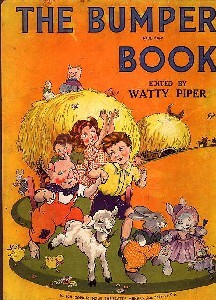 Watty Piper was known as the "house name" for publisher Arnold Munk of Platt & Munk Publishers. 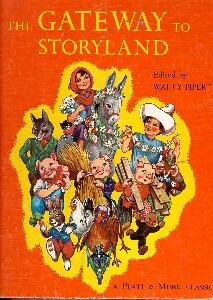 Under this name, many anthologies and folk tales were published during the publisher's heyday of the 1920s-1950s, including many stories illustrated by the popular Eulalie , Lois Lenski and Holling C. Holling. The Little Engine That Could has a long and cloudy authorship history, including editions by Mabel C. Bragg, "Uncle Nat," and Watty Piper. The latter version came onto the scene first in 1930 with illustrations by Lois Lenski, and again in 1954 with now-famous illustrations by George and Doris Hauman. We have requests for all of these anthologies, and often have some in stock. Although most of these are out-of-print now, they were reprinted for years into the sixties, with several different bindings, and sometimes differing number of stories included. Please inquire. Animal Friends Story Book. Platt & Munk, 1928. Brimful Book. Illustrated by Eulalie. Platt & Munk, 1929. Bumper Book. A Collection of Stories and Verses for Children. Illustrated by Eulalie. Platt & Munk, 1946. Children of Other Lands. Illustrated by H.C. Holling. Platt & Munk, 1933. Children's Hour with Mr. Tabby Cat and other stories. Platt & Munk, 1929. Fairy Tales Children Love. Platt & Munk, 1932. Famous Fairy Tales. Platt & Munk, 1928, 1933. Famous Rhymes/Mother Goose. Various illustrators. Platt & Munk, 192, 1928. Favorite Nursery Tales. Platt & Munk, 1934. Ginger Bread Boy and Other Stories. Platt & Munk, 1927. Gateway to Storyland. A Collection of Stories and Verses for Children. Illustrated by Eulalie. Platt & Munk. Jolly Rhymes of Mother Goose. Illustrated by Lois Lenski. Platt & Munk, 1932. Little Engine That Could. Illustrated by Lois Lenski. Platt & Munk, 1930. *Little Engine That Could. Illustrated by George & Doris Hauman. Platt & Munk, 1930, 1945. Little Folks/Other Lands. Illustrated by H.C. Holling. Platt & Munk, 1929. Nursery Tales Children Love. Illustrated by Eulalie. Platt & Munk, 1925. Road in Storyland. Platt & Munk, 1932. Stories Children Love. Illustrated by Lois Lenski and Eulalie. Platt & Munk, 1932. Stories That Never Grow Old. Best Loved Stories Retold by Wattie Piper. Illustrated by George and Doris Hauman. Platt & Munk. Tales from Storyland. Illustrated by George & Doris Hauman. Platt & Munk, 1941. Tick-tock tales. Platt & Munk, 1931.